What are known bugs in v6.0 that the team is currently working? Our v6.0 is a major update with vasty change under the hood for iCloud Drive syncing, the way pages are rendering and hundreds of code lines are refactored (this is required for further upgrades to the software). There are some bugs we would miss during our testing as QA had run many test cases in countless times for each internal testing cycles. We're having our Dev looking into the issues reported by users. Dropbox is stuck at syncing forever and I couldn't export the notebook to Dropbox as before? As stated above, there is a bug with Dropbox syncing and export file to Dorpbox service. We'll provide another update soon to address this issue. Meanwhile, users can still export their notebooks to Dropbox in these steps: open a notebook, go to Tools > Export, tap "Destination" and set it to "Another App". Once you tap "Export", select Dropbox from the list (make sure Dropbox app has been installed on your iPad). App becomes sluggish when writing with iCloud Drive enabled. What's happening? We're sorry about the issue! Are you using Notes Plus with iCloud Drive sync enabled? We've revised almost entire iCloud Drive syncing code and the app would scan through all your iCloud Drive files after updated to version 6.0. This process will involve with uploading/downloading a lot of resource files and some notebook attributes, eventually this causes some extra loops in our code that it's affected overall app performance during syncing. We know this issue would affect your workflows significantly and we're trying to solve this issue as soon as we can! Why all my straight lines in existing notebooks become invisible after the update? Indeed, this is a new bug in v6.0 and our developer has just put another fix and we'll submit another release soon. Your shapes are still existed there (but they're transparent and invisible on the page). Please don't attempt to make changes to your existing notebook until another update has been released and it should repair affected notebooks automatically. We'll keep our users posted when a fix for this issue is ready for download on App Store. My notebooks aren't added to Favorites/Recents as they should be in previous version? We admit this is a new bug introduced in v6.0 when iCloud Drive/Dropbox auto backup is disabled. We're having our Developers to fix this issue shortly. What should I do if the app couldn't launch after updated? If somehow Notes Plus can't launch after the update (which is rare), we suggest you shouldn't uninstall the app/re-install from App Store as it will wipe out your app data on your device. Instead, you can try to reset the app to its default settings via iTunes. 1. Exit the app from the background: from the Home screen, double-press the Home button to reveal the background dock, and swipe up on the Notes Plus screenshot. 2. Go to "Notes Plus Documents" via iTunes File Sharing (see http://support.apple.com/kb/HT4094 ), select NAppProperties.plist and hit the Delete key on your keyboard. Usually the app should work normally after a hard reset. I want to access my notebooks but they're stuck from iCloud syncing task? What should I do? If you're experiencing issues with iCloud Drive and couldn't access your notebooks, please follow our instructions to restore the data from iCloud Drive backup and working on your notebooks normally. - Go to Library > Auto Backup > turn off iCloud Drive syncing and choose "Delete From This Device". Don't worry, your data copy is still remained on iCloud Drive server. This avoids data duplication later. Or if you decide to keep the data on your device, make sure to remove your notebooks on Library before turning on iCloud Drive syncing again later to avoid data duplication. - Re-launch Notes Plus app, wait for a moment and your notebooks will appear. I can’t use the Palm Pad at all because when I pull it up, Control Center pops up. What can I do? As a workaround, tap on the Palm Pad handle first, then pull it up further. Or you might want to go to iPad Settings >Control Center, and turn off Access Within Apps. I have problems recording. What can I do? Please go to iPad Settings > Privacy > Microphone, and make sure “Notes Plus” is turned ON and try again. My handwritten notes sometimes disappear as I write over them. What’s wrong? It might be due to “Deletion Gesture” and “Scrubbing Gesture” being too sensitive. Please go to Tools > App Settings and try turning them off. The app is acting weird. What should I try first to make it go back to normal? Exit the app from the background: from the Home screen, double-press the Home button to reveal the background screen, then swipe up on the Notes Plus screenshot. Reset to default settings: go to Tools > App Settings, and tap the button next to “Reset to default settings”. Restart your iPad: long-press the Sleep button for a while, power it off, then turn it back on. The app crashes frequently. What should I do? Our Dropbox auto-backup feature might also be the cause. Try going to the Auto Backup section and tap “Sign Out” if Dropbox sync is running. Also try the above (see the previous question). How come I can’t even launch the app? It flashes for a few seconds and then quits. Please reset the app to its default settings (see a previous question). I can’t play a recording or when I record, it seems to be recording, but I can’t find it later in the Recordings section. Go to iPad Settings > Privacy > Microphone, and make sure “Notes Plus” is turned ON. No other apps are using the Microphone. To be sure, from the Home screen, double-press the Home button to reveal the background screen, then swipe up on the screenshot of every app except Notes Plus. You might want to also exit Notes Plus this way and relaunch it. This usually fixes weird issues. I can’t back up the Notebooks folder via File Sharing per the instructions. The error message was, “Notebooks” could not be copied because an error occurred. The required folder could not be found. What do I do? Try using iTools to save “Notebooks”. Download and launch the application, click Applications (left sidebar), then ShareDocs (at the top), then Notes Plus (the list right below). Next, select “Notebooks” and click “Export”. Why does the screen jiggle when I’m trying to write with my stylus? Your palm is probably being misunderstood as a four-finger swipe, thus activating iOS Multitasking Gestures. Apple doesn’t allow changing this setting by code, so you’ll need to turn it off in iPad Settings > General when using Notes Plus. I selected my handwriting and tapped “Convert to Text” but I got an empty text box. Why? First, check that you’re using the correct recognition language for your text. For example, the HWR engine can barely recognize French text if its current recognition language is English. Second, try making the text box bigger (drag on the corner handle). 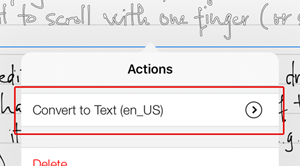 Also, while the text box is selected, try tapping the “text” icon on the toolbar and setting a smaller font size. I draw geometric shapes but they aren’t recognized (turned into vector shapes). How come? Set a lower shape detection threshold in App Settings to increase the sensivitity. Part of my notes are visible in the app but didn’t appear in the exported file. What’s wrong and how do I fix this? This is a technical limitation of continuous scrolling mode where an object spanning two continuous pages won’t be “seen” by the app on the lower page. While we’re working on a fix, go to the higher page, select the object and move it entirely within a page. How do I help troubleshoot crashes? Launch iTools (a very fast iOS file manager for Windows; Mac version). Click Advanced > Crash log. Click Export and choose a folder to save the file(s) in. Email the file(s) to support@notesplusapp.com. Alternatively, you can retrieve crash logs via iTunes, especially when you’re not on a Windows machine. Is there a Quick Start guide to all the features? Yes, there is! Tap Tools > Help > Quick Start. You can also get it here. How do I get the original Quick Start notebook after making changes to it? Please tap Library (top-left icon), swipe across the changed Quick Start notebook and tap the Trash icon to delete it. Then open the Quick Start Guide as above. How about a detailed User Guide? Just tap Tools > Help > User Guide. You can also get it here. How many languages are Notes Plus in? So far, the interface can be displayed in these languages: Chinese (Simplified), English, French (France/Canada), German, Italian, Japanese, Korean, Portuguese (Brazil), Russian, Spanish, and Vietnamese. Where can I find the “Tips” notebook? If you don’t see it in the Library, reset the app to default settings (see the Troubleshooting section below) and check again. How do I know what Notes Plus version I’m using? Tap Tools > About Notes Plus. Tap Tools > App Settings. Most of the settings are self-descriptive. Consult the User Guide if in doubt. How do I navigate through pages? To go to the previous or next page, tap the < or > icon in the page navigation field. Tap the page number button, then tap a thumbnail, or enter a page number to jump to. Long-press the right edge of the page (or the left if you’re in left-handed mode), scroll to find the right page thumbnail and tap it. To select anything (including handwriting), just circle it in Pen mode and tap the ✓icon that appears. To select a shape, image, or text box, tap it once in Pen mode, then tap the ✓ icon. Tip: after selecting it, tap the menu icon (three-parallel-line icon) that appears in the top corner of the selection to see what can be done on the object. Cool! But how do I rotate it? The command is not listed in the menu. Place two fingers on it and rotate. How do I redo an action? Long-press Undo on the toolbar to reveal the Redo button. But Undo/Redo doesn’t seem to work with typed text. How do I undo typing? Just shake your iPad and tap Undo Typing right after you make a typo. A better solution is to use Notes Plus Extended Keyboard, which includes Undo/Redo buttons for text. Just enable this functionality in App Settings and you’re good to go. Is there a quick way to insert the current date/time? Yes, there is. Tap Tools (top-right wrench icon) > App Settings and enable “Extended keyboard”. Then when the keyboard is visible, look for the date and time buttons in the topmost row. Note: The date and time format follows system settings. I’ve enabled “Extended Keyboard” but I don’t see it. Check that the virtual keyboard is docked. Long-press the key in the bottom-right corner and choose Dock or Dock and Merge, whichever appears. You can also try disabling and re-enabling the feature in App Settings. How do I enter close-up mode? Switch to Pen mode (Pen icon) and long-press anywhere on the page. See how close-up mode works. But I don’t see any Pen icon (or the tool I need) on the toolbar! Long-press one of the slots in the middle section and choose Pen (or the tool you need) for that slot. You can customize the other slots this way. There is such a button, but it needs a bit of setup! Long-press a slot in the scrollable Quick Tools near the top-right corner and choose the last button in the list. Going forward, you just need to tap this button to enter close-up mode. Can I format part of some text, and not the entire text? Unfortunately, Notes Plus doesn’t support inline formatting until a future update so you’ll need to use several text boxes and give each of them different formatting. Can I use custom paper backgrounds? If so, where can I get some? Annotate on these pages.You can also find more PDF templates from the Internet, like this site. What styli are recommended for use with Notes Plus? Notes Plus is designed to work well with any capacitive styli or just finger. However, if you prefer a fancy bluetooth stylus with fine tip and integrated palm rejection, we recommend Adonit's Jot (or Pixel) or Apple Pencil. How about Wacom styli and FiftyThree Pencil? Does Notes Plus support them? Swipe left/right in the scrollable Quick Tools area near the top-right corner and find the Mic icon. If you don’t see it, long-press any slot there and tap on the Mic icon to assign it to that slot. Tap this Mic icon to start and stop recording. Can I hear just what was recorded on a page instead of the entire recording? Sure you can. The number of recordings made on a page is shown on the Playback icon next to the Mic icon. Tap the Playback icon to access the recordings. How about accessing full-length recordings? Tap Library (top-left icon), and tap the Recordings section in the left sidebar. How do I save them to my computers? Hook your iPad to your computer and launch iTunes. Open “Notes Plus Documents” (http://support.apple.com/kb/HT4094). Save the .caf files from “Notes Plus Documents” to your computer. For more details, see “Save recordings to your computer” in the User Guide. Can’t I save them as .MP3 files instead? Sorry you can’t. To convert .CAF files into the MP3 format, check out this site: http://media.io. How do I convert handwriting to typed text? In Pen mode, circle some handwriting then tap “✓” to select it, then the menu icon (three-line icon), then tap Convert to Text. Tip: Tap “>” next to “Convert to Text” to choose the recognition language or tap More and download more languages. What recognition languages does Notes Plus support? We support the following languages: Arabic, Armenian, Azeri, Basque, Bulgarian, Catalan, Chinese (Simplified & Traditional), Croatian, Czech, Danish, Dutch, English (Canada/UK/US), Estonian, Finnish, French (Canada/France), Galician, German, Greek, Hebrew, Hungarian, Icelandic, Indonesian, Italian, Japanese, Kazakh, Korean, Latvian, Lithuanian, Malay, Norwegian, Polish , Portuguese (Brazil/Portugal), Romanian, Russian, Serbian (Cyrillic/Latin), Slovak, Slovenian, Spanish (Mexico/Spain), Swedish, Thai, Turkish, Ukrainian, Urdu, and Vietnamese. How do I change to a preferred recognition language? Just select your handwriting, tap the menu icon, then tap the “>” icon next to “Convert to Text.” Then you can select a language from the list or tap More and download new ones. How do I edit text converted from handwriting? First, select the converted text (tap on the text and then tap “✓” to select it). Then tap on it again to edit just as you would with a text box. Is it possible to convert handwriting to text as I write? Unfortunately no. We think on-the-fly conversion is not really efficient in terms of performance and convenience, since users would have to repeatedly go back to the time-consuming process of editing wrongly converted text. What can I do to improve recognition accuracy? Write in straight lines, leaving ample space between each line. Avoid complicated layouts, multiple columns etc. Write in clear horizontal blocks of text. And make sure the recognition language is intended (see a previous question). How are notebooks organized in Notes Plus? You can put them in the root folder or in another folder. The hierarchy is similar to that on a computer. Folders contain notebooks, which in turn contain pages. To begin with, how do I access the library that lists all my notebooks? Tap the Library (top-left icon). The right panel lists all the notebooks and folders. The left sidebar shows various sections and possible actions you can take when some items on the right are selected. Tip: turn your iPad to landscape to see the text next to each icon in the left sidebar. Open the library, tap New Folder, type a name and tap the return key. You can go to this folder (tap on it in the right panel) and create subfolders within it by repeating these steps. Open the library, go to a folder (on the right panel) where you want the new notebook to be created. Tap New Notebook, type a name, change other settings as needed, and tap the return key. Tip: while taking notes, you can quickly create a new notebook by tapping the “plus” icon in the scrollable Quick Tools area near the top-right corner, then tap Create New Notebook. How do I copy/move one or more notebooks into a folder? To copy/move one or more notebooks, tap Library (top-left icon), tap Edit (top right), select the notebook(s), tap Copy / Move in the sidebar, select a destination folder and tap Copy / Move in the header. How do I copy/move pages from one notebook to another? Tap Library, tap the “>” icon to the right of the first notebook in the library view to list its pages, tap Edit (top-right Pen icon), select one or more pages, tap Copy / Move in the sidebar, select the second notebook and tap Copy / Move in the header. How do I rename a folder, a notebook, or a page? You can swipe across a notebook, tap the first icon and rename it. While taking notes, tapping the notebook name near the top-left corner will allow renaming it. While taking notes, tap the page header in the top-right corner of the page to rename the current page. How do I rearrange the pages of a notebook? First, list the pages in List view: tap “>” to the right of the notebook in the library, then switch to the button that stays right below the Pen icon in library view. Tap the Pen icon to enter Edit mode. Drag each page up or down at the handle to its right. Tap the ✓ when done. You can search for notebook/folder names, page titles and typed text (including converted text, even if it’s not visible). To do so, tap Library (top-left icon) and tap the Magnifying Glass icon near the top-right corner. To search within a specific folder/notebook, list its pages first, then proceed as above. How do I password-protect a notebook? Tap Library (top-left icon), tap Edit (top-right Pen icon), select the notebook, tap the Lock/Unlock button in the sidebar and confirm. Then create a new password or enter the existing one. What file formats can Notes Plus import and export? Notes Plus can import PDFs and Microsoft Word documents (but not Google Docs formats). Support for other Office formats are coming. Notes Plus can export in PDF, PNG, and WebArchive (useful for sharing editable notebooks with other Notes Plus users; see a question below). How do I import a supported file? Use File Sharing and add it to “Notes Plus Documents”. Close and re-open Notes Plus and it will appear in the library. Tap on it to get it ready for annotations. This is the most reliable method. Long-press an attachment in an email message and choose “Open In Notes Plus”. If the attachment is large, you’ll need to tap it first to download it, after which you can long-press it and reveal the “Open In Notes Plus” option. Load it in Notes Plus browser (swipe right at the left edge to reveal this panel), then tap Import. (If it’s in a cloud account) Open the library and go to the Import section. Add a remote account if necessary. Tap to open the account and browse to the file and tap it. How do I export a notebook? Open it, tap Tools (top-right wrench icon) > Export. Next, tap each of the settings and choose a desired option. Tap Export. I only type my notes. Is there a way to export them as text in the body of an email instead of a PDF/image? Currently no. There will be an “Export as Text” option, though. Meanwhile, you can use iOS standard copy/paste command as follows: select ABC mode and tap on the text (or select T mode if you typed full page), tap again > Select All > Copy. Then go to another text field (e.g. your email), tap there and then tap Paste. How do I share a notebook with other Notes Plus users? Then enter the email addresses of the recipients. They will then long-press on the .webarchive attachment in the received email and choose “Open In Notes Plus”. Note: there’s a technical limitation where you can’t properly export PDF notebooks as WebArchives – the original PDF pages won’t be included. How do I export a notebook to a cloud service not already supported, like OneDrive? Please export the notebook to another app, then choose the cloud app (like OneDrive) from the list of apps. This will upload the exported notebook to that cloud. Does Notes Plus offer automatic backup? With which cloud services? Yes, Notes Plus does offer automatic backup. Your notes get backed up automatically to a cloud service of your choice. Notes Plus provides automatic backup with Apple's iCloud and Dropbox. How does iCloud auto-backup work? And how do I use it? iCloud auto-backup automatically backs up your notes to Notes Plus app location on Apple's iCloud. Each time you insert or edit a notes, your changes are updated on iCloud automatically. When you get a new device and want to restore your notes, install Notes Plus app and it will restore your notes from iCloud automatically. If you use multiple devices to take notes, Notes Plus syncs your iCloud data across multiple devices automatically. To use iCloud auto-backup, while in Library, tap on Auto Backup button on the left panel. Tap on iCloud icon in the right panel then tap on "Start Using iCloud". First time iCloud initiation takes a few minutes, please keep the app open until iCloud initiation finishes. How does Dropbox auto-backup work? And how do I use it? It automatically backs up your Notes Plus data to a preferred location (aka backup folder) in your Dropbox account and restores the data if needed (for example, when you reinstall the app, or install it on a new or restored iPad). If you add an item (i.e. a notebook / folder) in Notes Plus, it will be uploaded to the backup folder in Dropbox. If you delete an item in Notes Plus, the remote version in Dropbox will be deleted. If you add a supported file under the backup folder, it will be downloaded to Notes Plus library. If you delete an item under the backup folder, the local version will NOT be deleted from Notes Plus. Instead, Notes Plus will re-upload the newly deleted item to Dropbox. To start using this feature, while in Library, go to the Auto Backup section and tap Dropbox icon. How do I manually back up and restore data without using iCloud or Dropbox? Locate “Notes Plus Documents”. Read about File Sharing (see http://support.apple.com/kb/HT4094 ) and you will know where that is. Wait while the app unzips the backup and loads it before you can see your old notes. The .zip file will be deleted from Notes Plus Documents when this process is done. How do I migrate all my notes from an old iPad to a new one? Install Notes Plus on the new iPad. Go to Library and turn on Use iCloud Auto-backup (see question above). Notes Plus will pull your notes from iCloud to your iPad automatically. Use Dropbox auto-backup on the old iPad. Wait a while for the notes in Notes Plus to be uploaded to your Dropbox account. Use Dropbox auto-backup on the new iPad. Wait a while for the notes in Dropbox to be downloaded to your Notes Plus library. Connect your old iPad to iTunes. Via File Sharing, save the Notebooks and Recordings folders from Notes Plus Documents to your computer. Connect your new iPad to iTunes. Add the zip file (in step 2) to Notes Plus Documents (refer to the File Sharing link above). Launch Notes Plus in the new iPad. Wait while the app unzips the backup and loads it before you can see your old notes. The .zip file will be deleted from Notes Plus Documents when this process is done. Click Applications > ShareDocs > Notes Plus. Click Import > Folder and select the Recordings folder that you backed up. Can Notes Plus sync to Dropbox as PDFs so they can be conveniently viewed? We’re afraid it can’t at the moment. Generating a PDF for every change made to a notebook is an expensive operation that could hang your iPad if not implemented carefully, but we’ll keep exploring this. When I link with Dropbox for auto backup, why does Notes Plus ask for read/write permissions to my entire account? Notes Plus needs to create a folder within Dropbox named NotesPlus that stores all your backup files. For flexibility, we allow users to change this default folder to a different one. Other apps with auto backup to Dropbox (i.e GoodNotes/Notability/GoodReader, etc…) are doing the same thing, requesting full access to all files and folders. You can always monitor the sync log on Dropbox’s website via https://www.dropbox.com/events. How do I best use the browser panel? Open a notebook for viewing while taking notes in the paper panel. See the next question. Use an online calculator, like http://instacalc.com. Open a clip art site and use an image there in your notes. Check out this great site for royalty-free images: http://openclipart.org. Check email, Google Calendar, etc. Handwrite your search queries in Google! Create images of equations and send them to the other panel into your notes. Open this site. http://webdemo.myscript.com, and tap Math. If you discover any other good uses, please let us know. Thanks in advance. Is it possible to view a notebook in the browser panel? Absolutely! Just tap Library (top-left icon), swipe across a notebook and tap the dual-panel icon next to the Trash (Delete) icon. Note that the browser panel is for viewing only. I’m interested in your app but I don’t use an iPad. Do you have plans to port the app to another OS like Android or Windows 8? We do, but not in the near future, as we’re focusing on bug fixes and usability improvements on this iOS version. It’s never a good idea to migrate the same bugs and weaknesses to another platform, so we believe users of these platforms will benefit a lot from this wait. We do have what we consider a free, lighter version of Notes Plus, called INKredible on iOS, and INKredible on Android. You’re invited to download the FREE app on your device to get a feel for the inking technology that we use in Notes Plus. Do you support syncing to Evernote? We’re afraid this is currently impossible because Evernote has limited third-party calls to its services. We’ll implement it in the future. Meanwhile, you can long-press on “-” on the keyboard and get a bullet. Better yet, create a shortcut for it (see the previous question). How do I take a screenshot of my iPad screen and send it to Support? Press the Lock and Home buttons on your iPad simultaneously, then check in the Photos app and email it to us along with your question. Alternatively, you can upload it to a free image hosting service like PostImage.org and include the image link in your comment. Screenshots if they help explain it. We also welcome suggestions and ideas to make the app better. Let us hear what you think.